Washington - A day after speaking to the Veterans of Foreign Wars in the nation's capital, President Bush took his conversation with the American people about the war on terrorism to Louisville, Kentucky, talking to and answering questions from his audience. 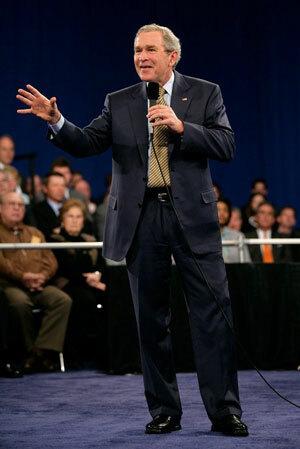 President George W. Bush speaks during remarks on the Global War on Terror in Louisville, Kentucky, Wednesday, Jan. 11, 2006. He expressed a willingness to answer questions about domestic as well as international topics, but the president confined his opening remarks to the War on Terror and U.S. efforts and goals in Iraq. The war against terrorism, he said, "came to us as a result of actions an enemy took on September the 11th, 2001 and I vowed that we'd find those killers and bring them to justice. "And that's what we're doing," Bush continued. "We're on the hunt for an enemy that cannot stand freedom [and] does not believe in free speech, free religion, free dissent, does not believe in women's rights, and they have a desire to impose their ideology on much of the world." Bush then explained the U.S. attack on Afghanistan's Taliban regime as a direct consequence of his publicly stated willingness to hold those who gave aid to terrorists equally condemnable with them. "We took action because the Taliban refused to expel al-Qaida," he said. Turning to Iraq, Bush said Saddam Hussein was "a sworn enemy of the United States," his regime was on the U.S. list of state sponsors of terror, and he had defied more than a dozen binding U.N. Security Council resolutions. Hussein, Bush said, had the choice, but "chose war, and he got war. And he's not in power, and the world is better off for it," he said. The U.S. goal in Iraq, Bush said, is "nothing short of victory." That victory will come, he said, "when Iraq is no longer a safe haven for the terrorists [and] when the Iraqis are able to defend their democracy." Bush characterized the enemy in Iraq as comprising three groups: Sunni rejectionists who benefited by Saddam's favoring of Sunnis over Shi'ites; the loyalists, who were "the thugs and people that basically robbed the country blind, and not only got privileged status, but they were the all-powerful"; and al-Qaida and its affiliates. To combat these three groups, Bush said, the U.S. and Iraqi governments are applying a three-pronged strategy: to marginalize and isolate the dissenters and rejectionists through the political process; to train Iraqis for military and police work to use force against their enemies; and to rebuild the economy, including a substantial effort to accomplish small, local projects. Local projects, he said, "empower those willing to take a risk for democracy with the capacity to say, 'follow me, your life is going to be better.'"